My job is not a tour guide, but to support the revival of the tourism industry in Hualien, I have been playing this role diligently recently, vigorously promoting and recruiting friends to visit and tour Hualien. 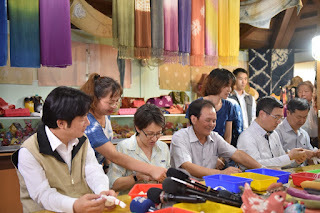 Following the presidential tour that was a gesture to assure the public of the safety and sustaining beauty of Hualien after the earthquake, my staff immediately started organizing the next official tourism inspection tour of Premier Lai 賴清德院長. 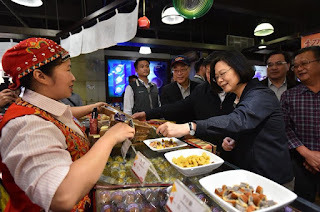 There are plenty of places to visit in Hualien, but the first challenge was to organize an itinerary that was different from that of President Tsai’s, introducing lesser-known sites and locations to the Premier and his press team. 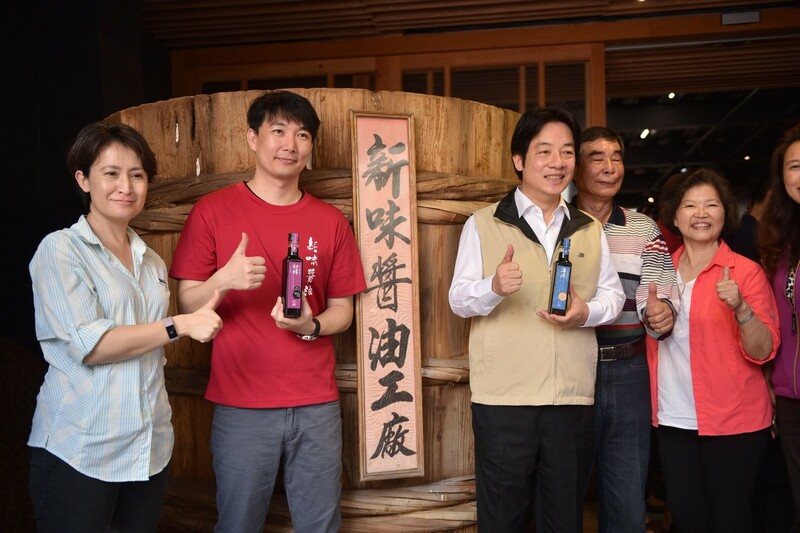 His Hualien tourism promotion delegation spent two days, April 14-15, 2018 in Hualien. The first stop was at the historic General’s Residence 將軍府, situated right in the middle of Hualien City. 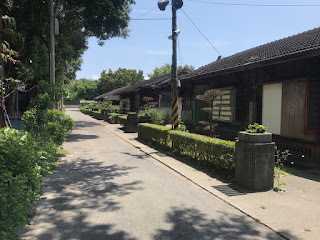 There is no record of any actual general ever living there, but the row of eight Japanese era wooden houses acquired its name as the General’s Residence because they once housed the Japanese commander of eastern Taiwan, and right across the street in what is today’s Military Police camp ground, the former war prisoner camp where US Pacific War General Jonathan Wainwright, along with other senior military leaders of the Allied Forces, was once incarcerated. Ownership of the Generals Residence and surrounding cluster of dilapidated old wooden houses remain with the Taiwan Ministry of National Defense, but since the houses have been designated cultural assets, refurbishing and renovation is to be expected with the support of the Ministry of Culture. Here we ran into a travel journalist of the South China Morning Post, who happened to be writing about Hualien travel and tourism. I certainly hope that such sites of historic and cultural meaning will interest visitors from Hong Kong and elsewhere. To support unique one-of-a-kind local brands and old shops, next we visited the New Taste Soy Sauce Factory 新味醬油工廠, a ninety-year soy sauce producer in the old town section of Hualien. Here you can find hand-made soy sauce fermented in complete traditional style, fermented tofu, and soy sauce produced using Deep Sea Water, also a unique product and gift of Hualien’s oceanic resources. 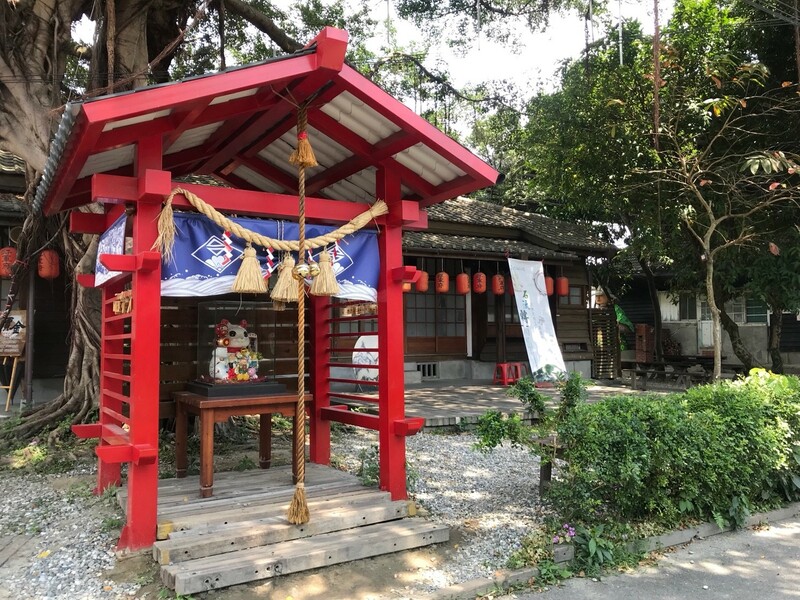 At its peak, there were several dozen soy sauce producers in Hualien, especially during the age when transportation difficulties made bringing in such products from other counties too costly. But trends in mass production in the food processing industry, plus increasing transportation conveniences brought in low-cost competition from elsewhere, putting all but one traditional soy sauce producer out of business. 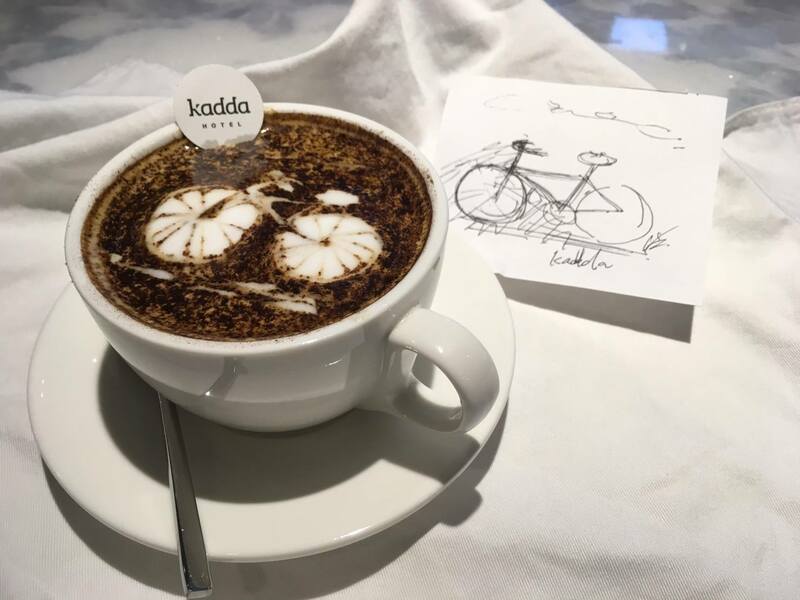 Now the shop is run by its third generation owner, carrying on the value of their products by an insistence on hand-made, no added-chemicals gourmet quality. Here all the journalists each got a bottle of soy sauce as a gift from Premier Lai. Our first afternoon started with a tour of the Hakka Culture Museum 客家文物館of Fenglin Township 鳳林鎮, a town in central Hualien whose residents are mostly Hakka and Amis. Though not very large, here we found displays of the history of migration of Hakka people to this region, and relics of traditional Hakka lifestyle and culture. For a small-town museum, it is not common to find English language introductions of the various displays. 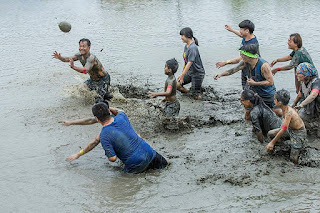 Obviously, this town which was the first Taiwanese town to join Cittaslow -- a movement of small towns celebrating a slower traditional lifestyle -- is eager to be seen internationally. Next to the Hakka Culture Museum is the natural fabric dye workshop. Here community volunteers will introduce visitors to natural dyes of assorted herbs and leaves, and various patterns and ways of creating fabric designs. 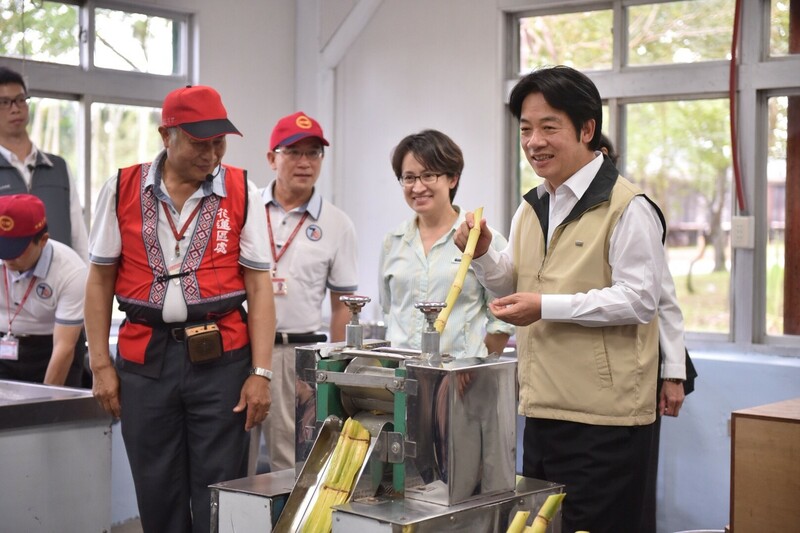 Premier Lai chose a brown dye made of onion skin, while I chose a yellow dye of a specific cooked leaf. We experimented with a blank white square fabric, but at the shop there are also selections of do-it-yourself white t-shirts or scarves. Already made, naturally dyed cotton or silk scarves are available for sale here. A few cats roaming around the workshop and its surroundings were quite friendly, posing for photos with the press corps as we boiled and dyed our fabrics. A favorite stop for visitors, especially on a warm spring afternoon, is the Taiwan Sugar Company factory in Guangfu Township 光復糖廠. 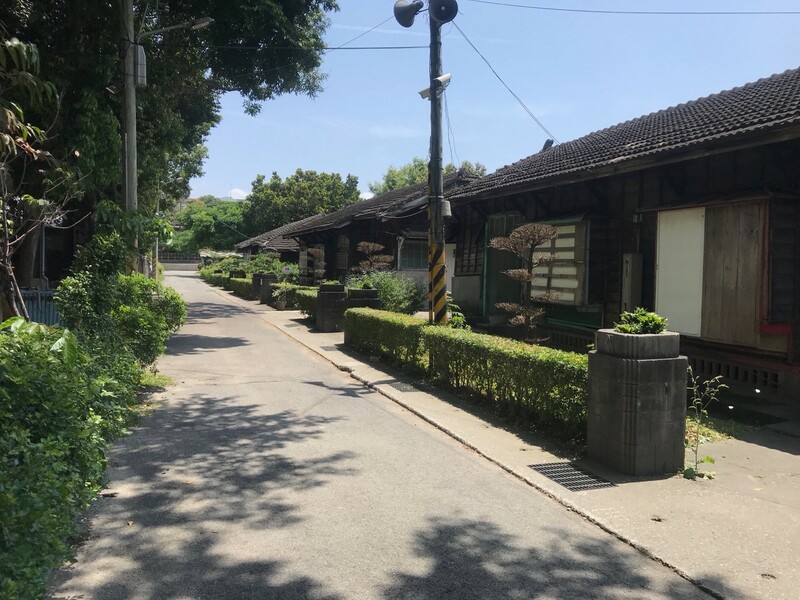 At the center of rural Hualien, the sugar company owns most of the farm land in the region, producing sugarcane in the past, and now just simply renting out to tenant farmers. For decades, the sugar factory was a center of economic activity in central Hualien. But ever since sugarcane phased out as a competitive crop for Taiwan, the factory made a transition to selling ice cream. It gets hundreds of thousands of stop-over visitors each year for a bowl of vanilla ice cream topped with red beans, a Taiwanese favorite. 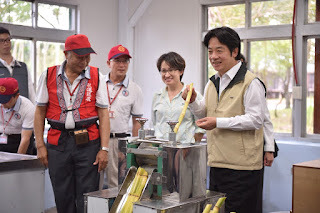 With a reservation, visitors can get a traditional taste of how sugar is made: Extracting juice from the sugarcane, cooking the juice until it forms a dark brown syrup, then quickly stirring the syrup as it cools until the color turns light and transforms into powder. Voila, your all-natural brown sugar! Extracting juice from the sugarcane. Sugarcane juice is heated then rapidly stirred, turning into a brown powder sugar. 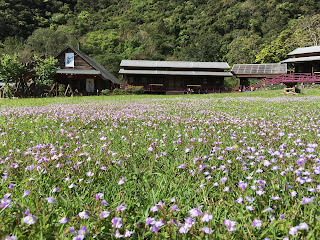 We had a feast at a traditional Amis restaurant, at the Red Tile House 紅瓦屋, located in the Fataan Tribal lands next to natural marshes. This rustic restaurant which showcases various sculptures and wood carvings of its Amis owners, was the site of a state banquet hosted by former President Chen for the President of the Marshall Islands in 2008. It is indeed worthy of a state banquet, serving delicious and unique Amis indigenous dishes of a wild vegetable salad, Amis ham Silaw 鹹豬肉, salt-caked baked fish, and the feature dish: a stone hot pot. No, you do not eat the stones. A large bowl made of betel nut husks, containing raw fish, vegetables, and cold water is brought to the table. Then hot burning stones as hot as 800 degrees are quickly added to the raw soup, producing a hot sizzling steam in the process. The fish is cooked, producing a tasty clear broth. Obviously, this particular dish requires a reservation in advance. Heating the stones does take time.